Welcome to this issue of newsletter delivers you updated info. Thank you for your continuously support to RAYSTAR News. Raystar Taiwan office, branches and China factories will be closed from February 2 thru February 10, 2019 for Chinese Lunar New Year Holiday. We will resume working on February 11, 2019. Please notice the below shipping date before and after the holiday. 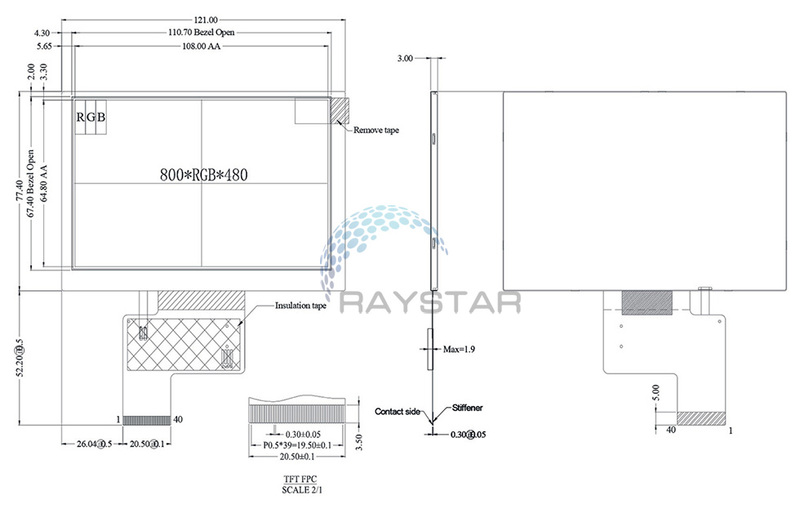 Please work with your Raystar sales persons closely before the holiday if your shipment might be affected. Thank you. 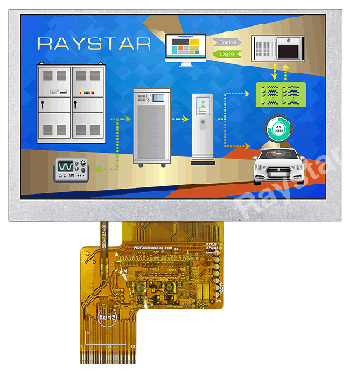 RFF700A4-AWH-DNN is a 7 inch super-bright, wider operating temperatures IPS TFT LCD module, with WVGA 800x480 pixels. This TFT model is built in with NT51632T and NT52601TT driver IC, it supports 24-bit RGB interface, brightness 1000 nits (typical value). This 7” IPS TFT has a wider viewing angle than TN TFT, the view angle is Left:85 / Right:85 / Up:85 / Down:85 degree (typical value). 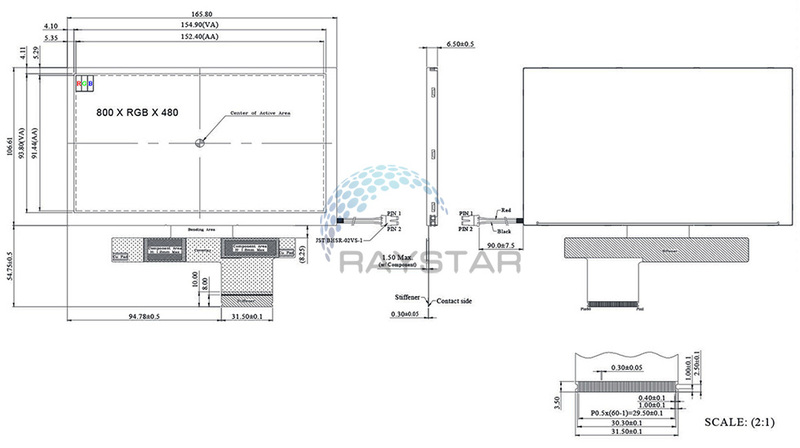 The supply voltage for logic (VCC) of RFF700A4-AWH-DNN is from 3.0V to 3.6V, typical value 3.3V, Glare 3H surface LCD, aspect ratio 16:9, contrast ratio 1000 (typical value). 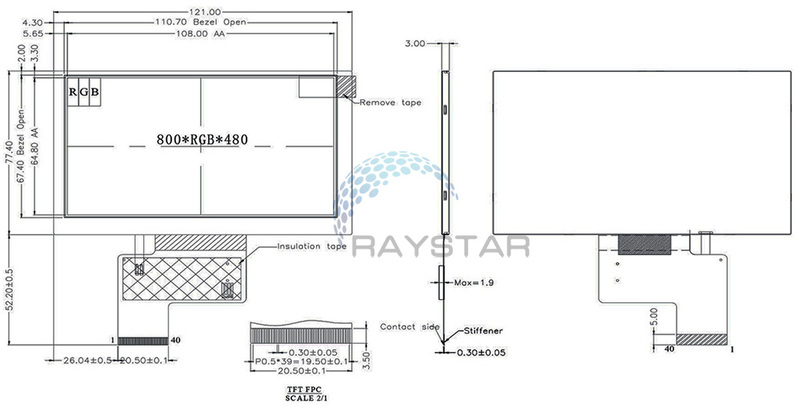 It can be operating at temperatures from -30℃ to +80 ℃ and storage temperatures from -40℃ to +90 ℃. 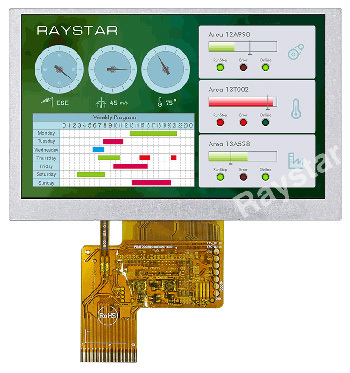 RFF500E-AWH-DNN is a 5 inch IPS TFT-LCD module with supper high brightness and wider operating temperature, resolution 800x480 pixels. This IPS TFT-LCD is built in with HX8249-A Source Driver IC and HX8678-C Gate driver IC; it supports RGB-24bit interface, with high brightness 1000 nits (typical value), aspect ratio 16:9, contrast ratio 1000 (typical value), Anti-Glare surface glass. This 5 inch IPS TFT-LCD is an IPS (In-Plane Switching) Panel which having the advantages of great angle-visibility of Left:85 / Right:85 / Up:85 / Down:85 degree (typical). RFF500E-AWH-DNN module can be operating at temperatures from -30℃ to +80℃; its storage temperatures range from -30℃ to +80℃. It is very suitable for outdoor applications. RFF500E-AWW-DNN is a 5 inch Wide Temperature TFT display with IPS great angle-visibility. 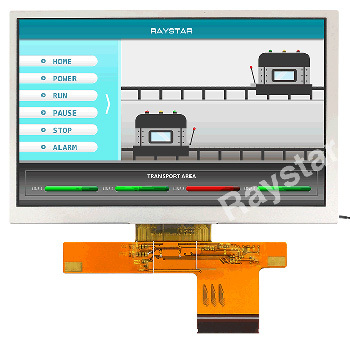 This IPS TFT display is featured with resolution 800x480 pixels and built in with HX8249-A source driver IC and HX8678-C gate driver IC; it supports RGB-24bit interface, with brightness 500 nits (typical value), aspect ratio 16:9, contrast ratio 1000 (typical value). This 5 inch IPS TFT-LCD is an IPS (In-Plane Switching) Panel which having the advantages of wider viewing angle of Left:85 / Right:85 / Up:85 / Down:85 degree (typical). RFF500E-AWW-DNN module can be operating at temperatures from -30℃ to +80℃; its storage temperatures range from -30℃ to +80℃.